You can now choose from treated wood decking that can be refinished or stained, or choose TAMKO Composite Decking in two different styles for lower maintenance. Our TAMKO EverGrain® Decking is compression molded composite decking featuring an incredibly true-to-life, deep lasting grain. Designed for those who love the natural look of real wood with low maintenance. EverGrain decking requires no staining or painting and is available in seven beautiful colors to perfectly complement any home. TAMKO EverGrain® Decking is available in 1" x 6" in 16' and 20' lengths. TAMKO EverGrain® Decking is stocked in Cedar, Weathered Wood and Cape Cod Grey finishes. Our TAMKO Elements® composite decking provides a beautiful and durable option for enhancing your enjoyment of outdoor living spaces. It is a quality extruded decking material that offers the look of wood, while enhancing performance and providing low maintenance. 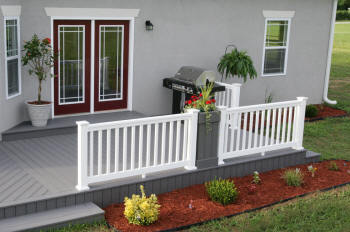 Elements decking comes with a 25-year limited warranty and is available in three attractive colors. TAMKO Elements® Decking is available in 1" x 6" in 16' and 20' lengths. TAMKO Elements® Decking is stocked in Cape Cod Grey only. TAMKO's Tam-Rail® Railing System is a patented triple-layer railing system that offers incredible performance and protection. The system features thick walls, outstanding stiffness, and superior rigidity—all in a product that is light in weight. Compare it to PVC railing products and see the difference for yourself. The low maintenance system comes with a 25-year limited warranty. Whether it’s on the stairs, on the porch, or on the deck, Tam-Rail is sure to add a beautiful and durable finishing touch. 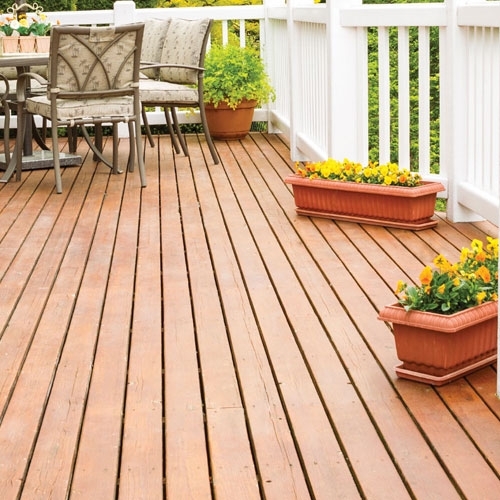 An all "Treated-Wood" deck will be your most economical way to enjoy the summer. Attach the deck to your home or make it free standing. Treated wood decking can be left alone, treated with Thompsons Water Seal or stained to add some color. Big L has an assortment of deck packages, or bring us your design and we can figure all the materials you will need. **Deck kits are figured as free-standing above ground installation (not attached to a house).